In June I received 2860 unique visitors without working on the blog at all – I was too focused on the OverHead but now I am trying to be better at balancing both. 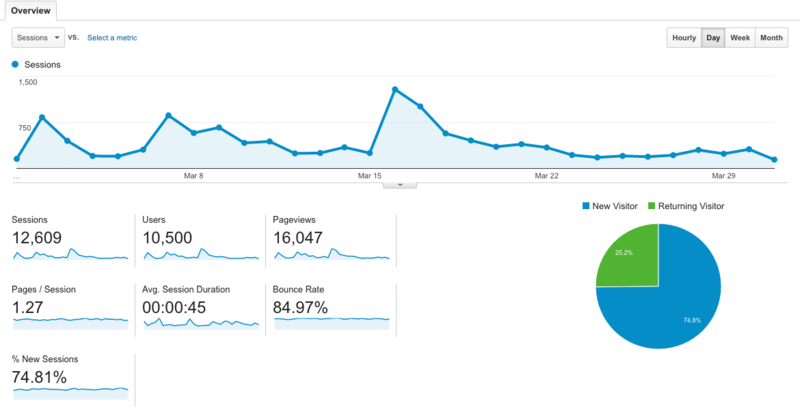 I started to get back into the blog in July, but not at full-force. I published 2 blog posts and two videos. The videos are the cause for the small spikes in traffic. 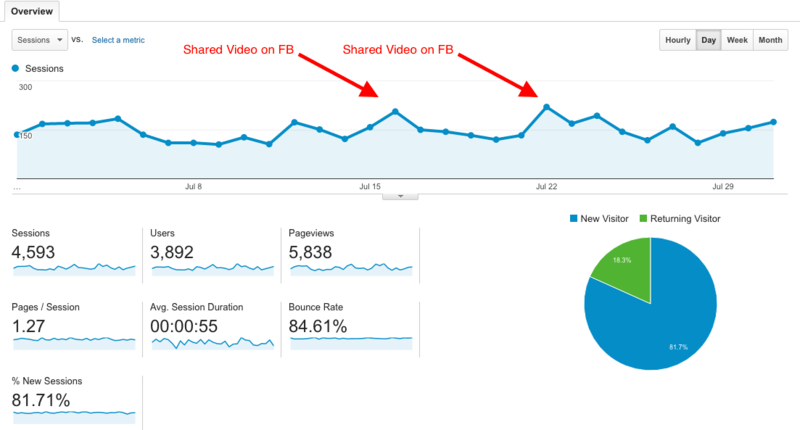 The days I shared the videos on FB I got over 200 visits that day on the blog. 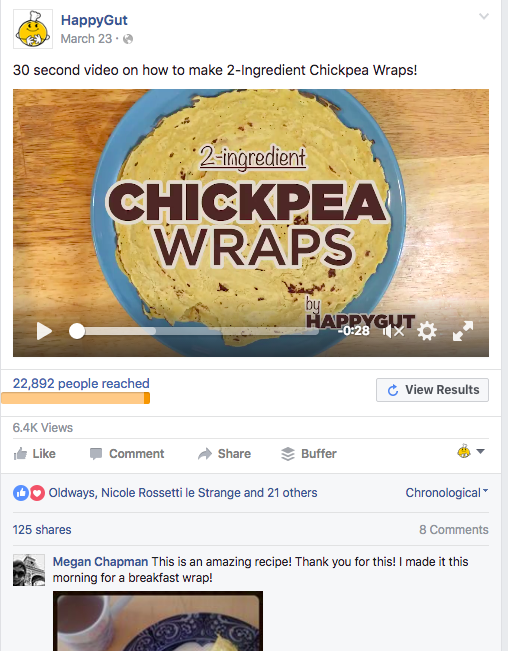 For Facebook, I received 207 new organic likes, of which 179 were on the days that I shared the FB recipe videos. I’m going to keep doing videos. 🙂 Stay tuned for next month! Alrighty folks, I’ve been meaning to write this post for quite a while now. 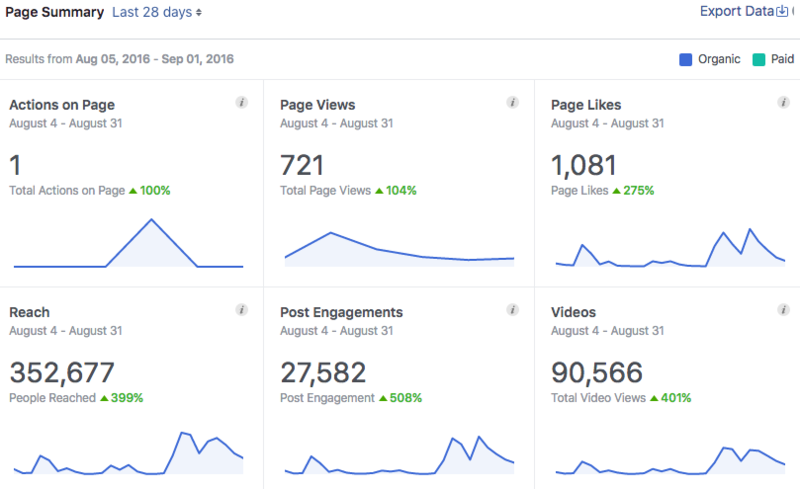 Despite the fact that I am so very embarrassed to show my results, this exercise will push me to grow my traffic and share what I do know so far. First, a bit of context. I started this food blog back in 2012 as a way to archive my recipes. The pictures were horrible (when I even took them), the SEO was negative, the posts were incredibly irregular (I’m talking about 6 months between posts) and the spelling mistakes were rampant (who am I ridding, they still are :P). I was getting a maximum of about 50 visitors of month, all of which were my kind family and friends. I will have to start from October 2015 as that was when I started to get serious about my blog traffic and use Google Analytics. Rest assured, I had virtually no traffic before that (about the 50 I mentioned above). As for income report, I have made a grand total of $76.71 ($34.72 from Google Ads and $41.99 from the Blendtec affiliate program). 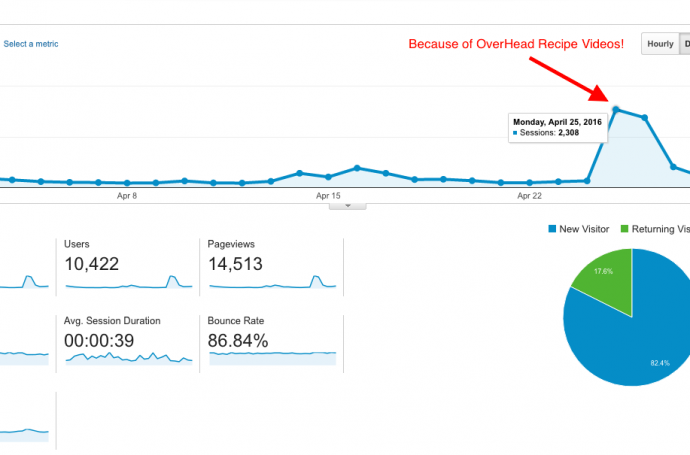 I believe that getting a lot of traffic is incredibly difficult and is an art. I also believe that monetizing your blog is equally hard and is also an art. I figure, I should learn one art, then learn the other. My immediate goal for my blog is to make $1k a month. 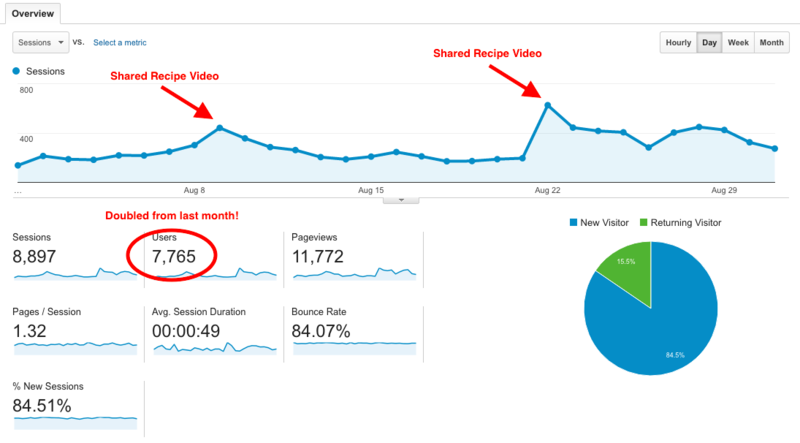 I’ve done enough research from other food bloggers to see that 100K visitors a month = $1k a month in revenue. 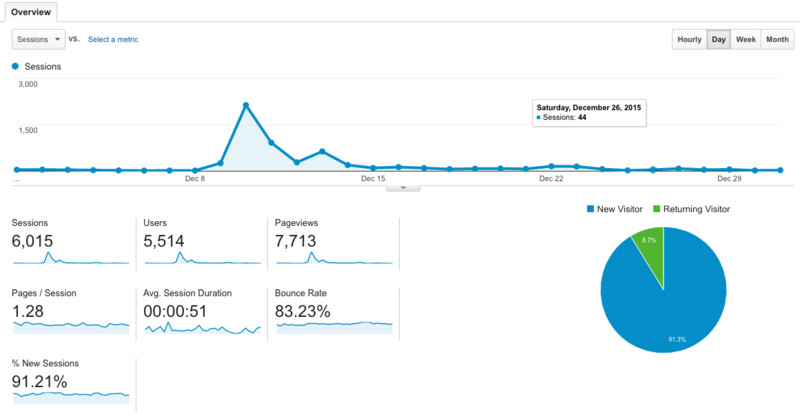 My goal is to get to 100k visitors a month. 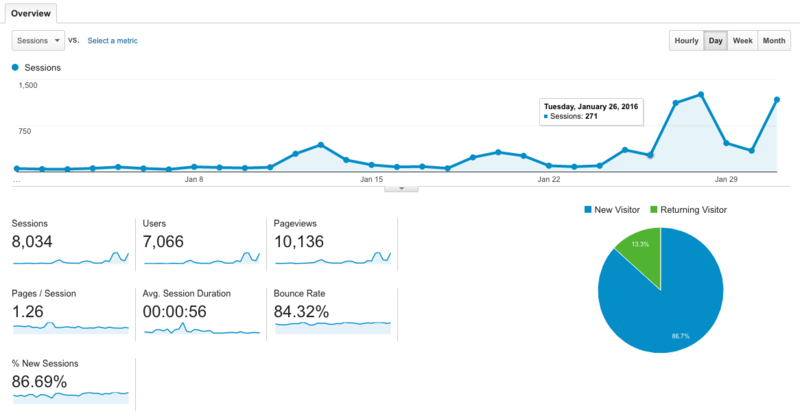 See below for my blog traffic journey so far. This was when I started to take my blog seriously. Though 318 users seems super small now, it was a jump from the ~50 users, so I was pumped! This month, I also started to learn about SEO and apply it to my posts. I started using alt tags for my pics and started to post regularly (1-2x a week). That spike you see is from a curated post I did of the best vegan meatloaf recipes that was promoted by the Fat Free Vegan on their Facebook Page (which has about 188K followers). I got over 400 visitors from that Facebook share alone. Note: Curation posts are great to get traffic! You can ask those you feature to promote to their (social) networks and sometimes you hit big, like what happened with me above. Thank you, Fat Free Vegan! My traffic blew up this month! The reason: BuzzFeed. 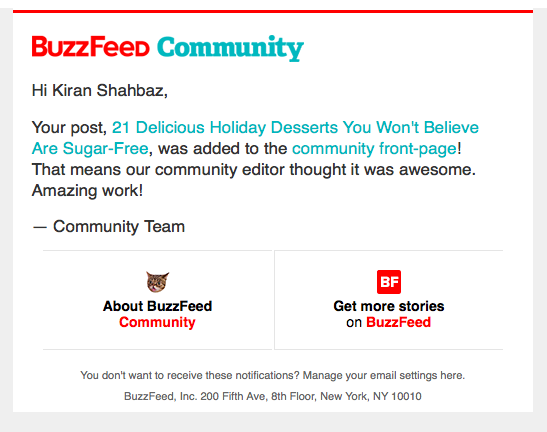 I started doing BuzzFeed articles and it paid off. 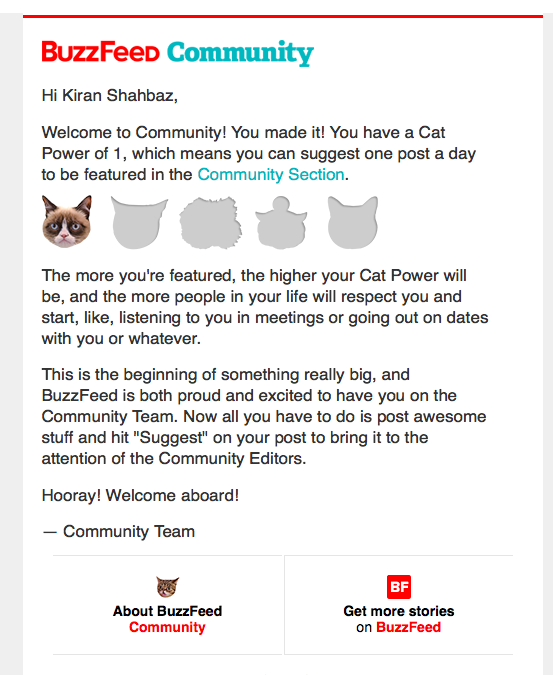 I tried a few articles before my post was picked up by an editor and I was granted “Cat Power.” (“Cat Power” is when an editor promotes your post so that someone other than you can see it. :P). Once it gets promoted, there’s no telling of how much love it will get. This post got to the front page of of the community section, and then made it to BuzzFeed’s homepage. Check out my prized emails below. 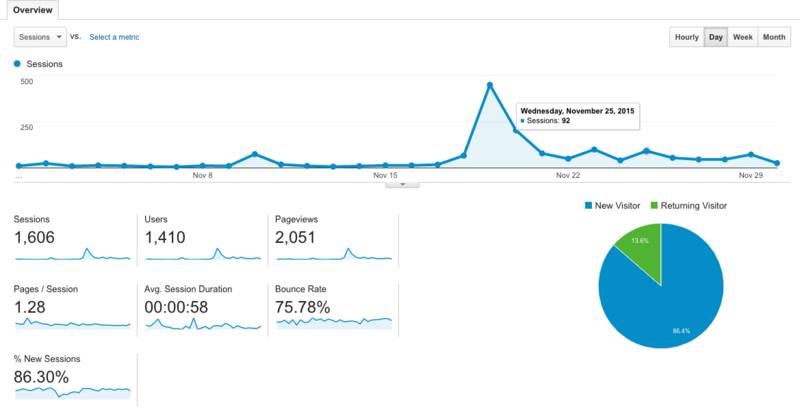 The blog keeps on a’ growin’! BuzzFeed for the win! 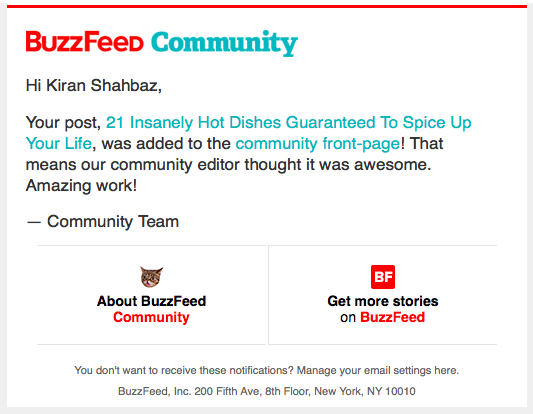 I got 2 posts that were featured again on the BuzzFeed community front page, and then were both promoted to the BuzzFeed homepage. This was an insightful month. 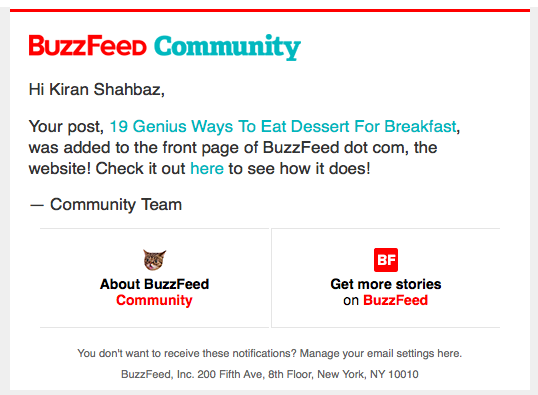 I got a few more BuzzFeed posts (3 posts were promoted to the community homepage and 2 of those ended up on BuzzFeed’s homepage). More importantly, I got 50+ email signups around February 10 — not to mention about 3000 visits. Where did this traffic come from? At first, I had no idea. I hadn’t done any BuzzFeed posts yet, and so when I woke up in the morning and saw all of the emails from MailChimp notifying me of all these signups, I was confused. Delighted, but confused. I ended up emailing someone who had subscribed, and asked where she heard of happygut, and how/why they signed up. The reader told me that they’d received an email from the Vegetarian Health Institute, who had promoted my post on the the best Vegan Winter Salads. This was an important insight. I realized that this was my type of audience. 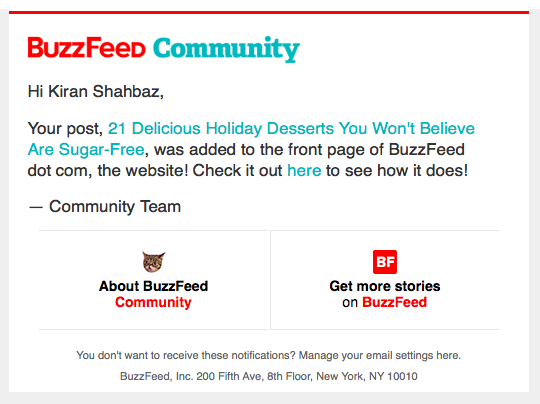 Though I’d gotten significant traffic from BuzzFeed to-date, I realized that I’d gotten very few signups from these users. 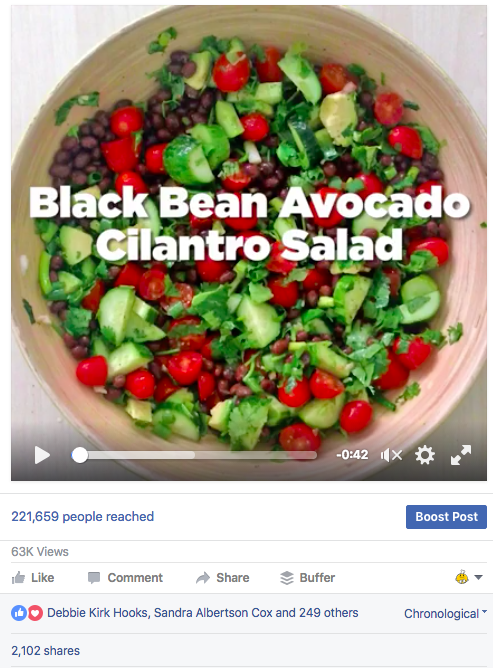 I needed to find users who liked MY content specifically (the vegan, gluten-free eaters of the world). You may be thinking “that’s obvious“, but it wasn’t so easy to see. 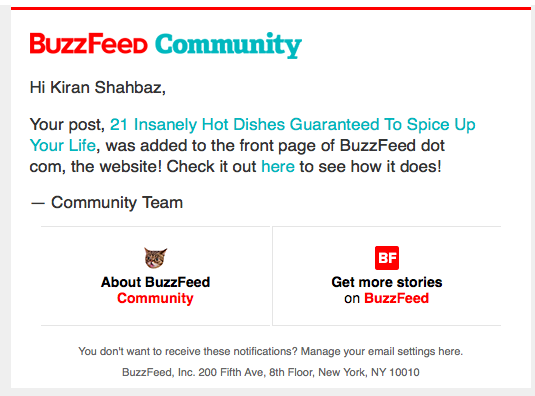 I had been caught up in the BuzzFeed spike hype, and hadn’t been paying enough attention into finding my unique user base. This made think more deeply about my marketing focus. 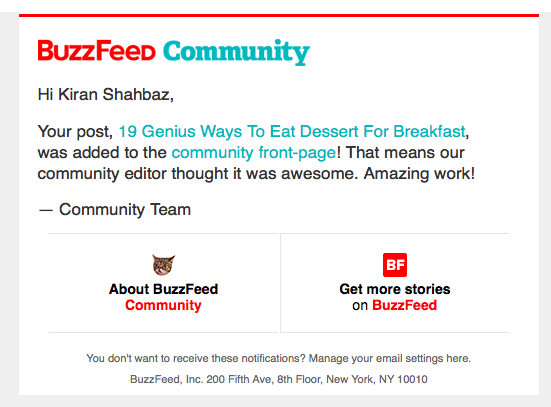 Two BuzzFeed articles were added to BuzzFeed’s community section, and one of them made it to the homepage. At this time, I decided to work on my blog full-time, and spend some time wrapping up my other business commitments. Though it is a pain to figure out, I also started to do overhead recipe videos with my smartphone. I was very pleased with the results. My video got over 6K views and 100+ shares on FB. In April, one BuzzFeed post made it to the community section. I also went on a cruise with my Mom, so I didn’t work on the food blog for half of the month. 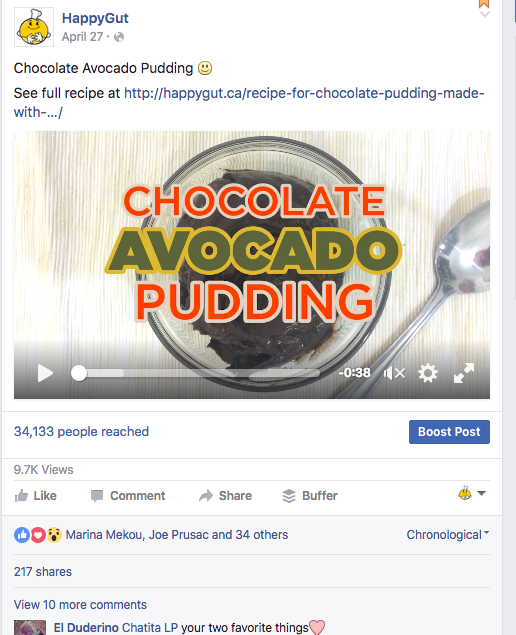 When I came back, I made a video for my Chocolate Avocado Pudding and it did very well on Facebook: almost 10K likes and 200+ shares. This caused that lovely spike in traffic. I had to wrap up my other business, and didn’t have time to work on the blog. I only did 2 posts the entire month. 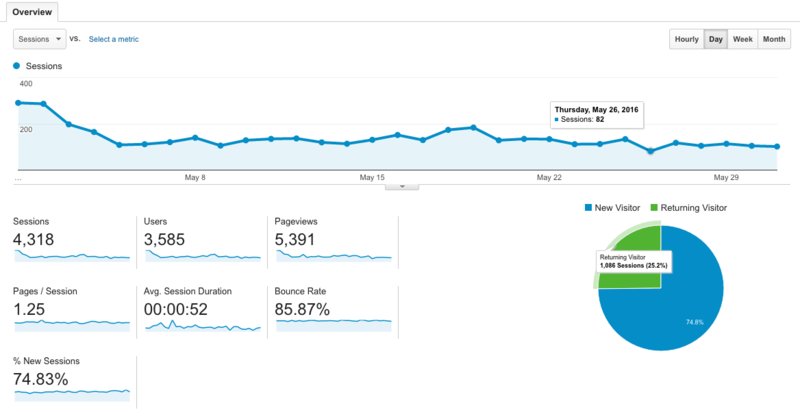 The interesting thing is that my base traffic increased. With zero BuzzFeed posts and no pushing of content, I still earned about 3500 visits, and my daily traffic hovered around 100-200. Also, because the entrepreneurial spirit is strong in me, I started working on another idea related to the Food Blog. As I mentioned, I’d started to produce overhead recipe videos. A few blogger friends ask me how they could do the same, and I got an idea. Since it wasn’t easy to figure out how to obtain a tripod rig to shoot my overhead videos, I worked with a manufacturer to create tripods built especially for overhead-style food video bloggers. You can see my website at getoverhreadpro.com and my post on how to make overhead recipe videos. 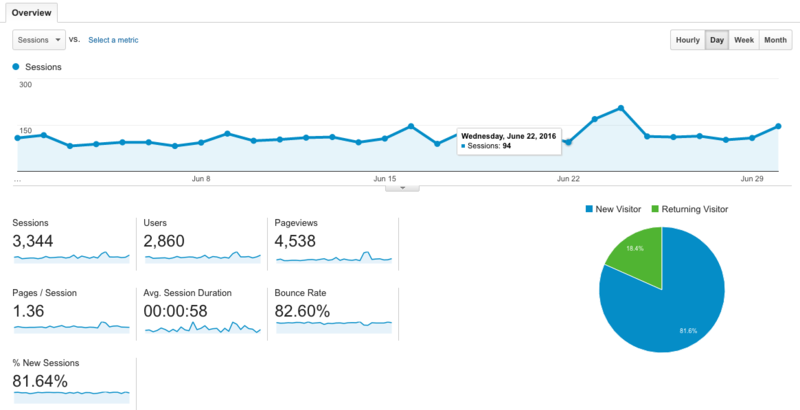 In June, I did not work on my food blog. OverHead Pro took off, and I was scrambling to keep up. I also added a video editing service component to the business. I figure, there could be food bloggers like me, who don’t have the time or desire to edit their own videos. 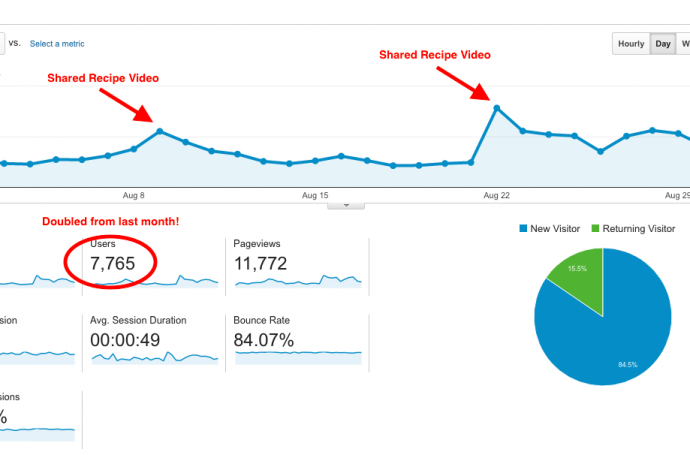 I also noticed that blog posts that have corresponding videos for them receive more traffic than those that don’t. Videos rock.